Lia Markey. 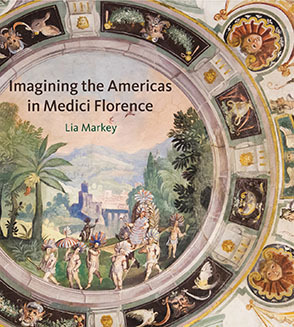 Imagining the Americas in Medici Florence. University Park: Pennsylvania State University Press, 2016. xvii, 241 p., ill. ISBN 9780271071152. $79.95 (hardcover). The reader, upon opening this book, is greeted by a stunning array of 110 colour and black-and-white images, including many details, which exhibit the depth and breadth of primarily Florentine representations of the Americas during the first few decades of Euro-American contact. Organized into a series a nine case studies, each of which focuses on specific works of art and material culture that formed part of the collections created for or viewed by Cosimo de’ Medici’s sons (specifically from the onset of the ruler’s reign in 1537 to the end of his son’s reign in 1609), the book is framed by a brief introduction. The book thusly not only explores these artifacts originating from or made to represent the Americas, but it also meditates on the practices of collecting as well as the ways through which collections are encountered in this same cultural and historical moment. Gerhard Holzer, Valerie Newby, Petra Svatek, and Georg Zotti, eds. A World of Innovation: Cartography in the Time of Gerhard Mercator. Newcastle upon Tyne: Cambridge Scholars Publishing, 2015. xvii, 261 p., ill. ISBN 9781443871532. £47.99 (hardcover). The scholarship contained in this book was convened by the editors at a conference held in Vienna in 2012 in celebration of the 500th anniversary of Gerhard Mercator’s date of birth. The thirteen chapters of this edited collection are spread over four thematic sections, the most substantial of which houses five chapters that examine the Hapsburg Empire in light of this cartographer’s lifespan.